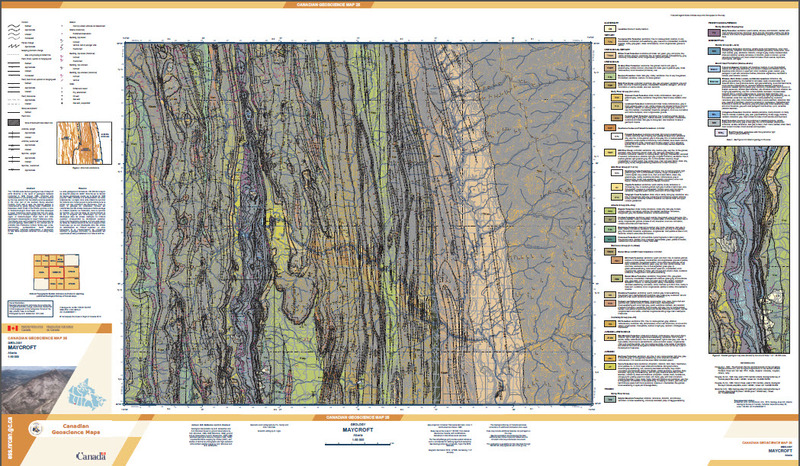 The 1:50 000-scale bedrock geological map of Maycroft (NTS 82-G/16) is the result of geological fieldwork conducted in 1993 through 1996, combined with reinterpretation of pre-existing maps. The area covered by the map extends from the Alberta syncline westward to the inner part of the southern Rocky Mountain Foothills. From east to west, the bedrock geology is characterized by gently dipping Upper Cretaceous to Paleocene clastic strata in the Alberta syncline, a zone of hinterland-vergent thrust faults and folds developed in Upper Cretaceous clastic strata that form the upper detachment of a complex triangle zone, and a broad region of foreland-vergent thrust faults and folds developed in Mississippian to Upper Cretaceous strata. The triangle zone and Livingstone Thrust dominate the structural geology. Deformation is thin skinned and of probable Late Cretaceous to Early Tertiary age. A few east-trending, syndepositional faults affected Mississippian carbonate sedimentation. A depocentre for late Albian explosive volcanism occurs along Daisy Creek.